TIBURON Calif. (Reuters) - Robin Williams, the versatile actor whose madcap comic style made him one of television and film's biggest stars, was found dead on Monday from an apparent suicide at his home in Northern California. He was 63. The Marin County Sheriff's coroner's division said it suspected Williams committed suicide by asphyxia, but the cause of death is still under investigation and an autopsy will be conducted Tuesday. "This morning, I lost my husband and my best friend, while the world lost one of its most beloved artists and beautiful human beings. I am utterly heartbroken," Williams's wife Susan Schneider said in a statement. 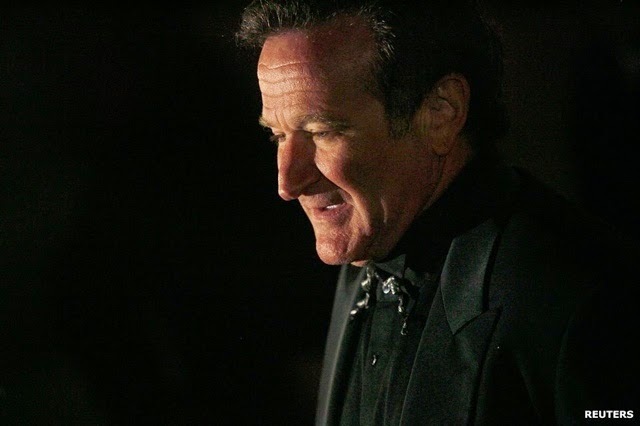 Williams, who won an Academy Award for his supporting role as a fatherly therapist in the 1997 drama "Good Will Hunting," had been suffering from severe depression recently, his publicist Mara Buxbaum said. Williams had struggled with addiction in the past and had entered a Minnesota rehabilitation centre this summer to help him maintain sobriety. His representatives at the time said Williams was not using drugs or alcohol but had gone to the centre to "fine-tune and focus" his sobriety after working a longer-than-usual schedule. The death of Williams, who had introduced his frenetic and physical style as the quirky alien in the late 1970s TV comedy "Mork & Mindy", shook Hollywood, and fellow actors mourned the loss of what many called a big-hearted man and one of the most inventive comedians of his time. Fellow comedian Steve Martin said in a tweet: "I could not be more stunned by the loss of Robin Williams, mensch, great talent, acting partner, genuine soul." The Marin County Sheriff's office said it received an emergency call about noon local time on Monday, saying that Williams was unconscious and not breathing at his home near Tiburon, north of San Francisco. Williams is scheduled to appear in "Night at the Museum: Secret of the Tomb" on Dec. 19, 2014, playing the statue of Teddy Roosevelt who comes to life at night. Twentieth Century Fox, which will distribute the film, had no immediate comment. In April, the Hollywood Reporter said that Fox's Fox 2000 division was developing a sequel to his 1993 hit "Mrs. Doubtfire" that would reunite Williams and director Chris Columbus. In the film, Williams played one of his most enduring roles as a struggling actor and divorced father who assumes the identity of a British nanny to be closer to his children. The actor was most recently in the CBS television comedy "The Crazy Ones," which was cancelled in May after one season. Williams, who was born in Chicago in 1951 and grew up in suburban Detroit, was as skilled at comedic riffing as he was as a dramatic actor, earning four Academy Award nominations, the first for his portrayal of U.S. Army deejay Adrian Cronauer during the Vietnam War in "Good Morning, Vietnam." He also earned nominations for the 1990 coming-of-age prep school drama "Dead Poets Society" and "The Fisher King" in 1991 in which he plays a homeless man who helps save a suicidal radio host. Williams' final tweet was posted on July 31. He wished his daughter Zelda a happy 25th birthday.